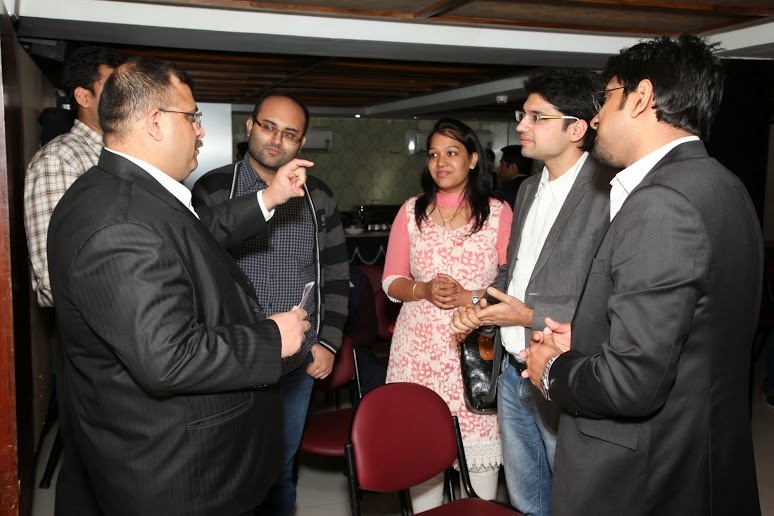 IAIP Kolkata was delighted to host Vikram Ganpule, Executive Chef, Hyatt Kolkata, on January 3rd, 2014, as the speaker for its monthly speaker event series. The event commenced with an introductory speech by Vinay Bagri, CFA, East Zone Coordinator, IAIP who emphasized on the importance of covering other areas outside the gamut of Finance and hence the topic for the Event “Social Etiquette and Food Diplomacy”. The hour and half session demystified the jargon called Social Etiquette. “Assumption is the mother of all screw-ups”- Murphy’s Law, a very common though mistaken by most of us. Ganpule reiterated his belief of Social Etiquette taking precedence over Food Diplomacy. The session pointed out some of the social etiquettes to be kept in mind, which would help us become more confident and professionally acquainted in a gathering. He pointed out the rudiments which most of us know but forget practicing like “Not to RSVP” is a sign of rudeness, way we meet and greet people (smile in eyes, firm handshake and eye contact), importance of being on time or rather before time, bringing an appropriate gift, proper attire for the occasion, cultural understanding i.e. doing the homework prior to addressing the crowd, putting the cell on silent mode, small gestures that go a long way in building an image. He covered some of the Do’s and Dont’s like checking personal grooming (neat hairstyle, manicured nails), using deodorant or good cologne, avoid attending events if suffering from cold and cough, holding doors open, receiving compliments graciously, consistent courtesy and respect towards service staff, listening carefully and patiently and the most importantly the usage of three magical words- please, thank you and sorry along with the importance of listening and being courteous with everyone. The exit strategy plays a pivotal role in building an image over social gathering meaning leaving the event at a suitable time. Ganpule was very kind to give us visibility on the importance of having a seating plan and pre-ordering if someone is to host a gathering for more than 15 people. He accentuated the topics that should be covered (like where are they from, where did they grow up, family, siblings, hobbies, favourite holiday destination etc.) and avoided (politics, religion, money, health problems) at dinner table conversations along with the tricks on how to conquer the culinary and social bastion with the ease of a professional. Some of the basic though important things like choosing appropriate restaurants, giving adequate notice, asking food preferences and allergies, map with the invitation, cleaning of the toilets, ensuring a good guest mix, asking specific questions, controlling the flow of the party etc. Basic table and restaurants manners like waiting till the host sits, proper usage of napkin, giving the server proper attention, starting to eat only after host has done so, eating slowly, not talking while food is in the mouth. Keeping the fork and knife/spoon together and placing them parallel is the traditional gesture to have finished with the napkin partially folded and placed on the left of the plate. He emphasized on the importance of sending a thank you note to the host/hostess within a day or two after the event. In the end, the veteran Chef left the young gathering with his final piece of advice “It is difficult till you don’t know…you will definitely enjoy once you learn the art”, before throwing the floor open for questions. It was an exciting session with participants discussing some events which made them feel uneasy, nervous and unsure of what to do. This entry was posted in Events, Kolkata, Speaker Events and tagged CFA Institute, Hyatt, IAIP, Indian Association of Investment Professionals, Kolkata, Nisha Gourisaria CFA, Vikram Ganpule, Vinay Bagri CFA. Bookmark the permalink. Very interesting update – thank you.